The sheriff's office has thick binders filled with descriptions of the bodies that Martinez and his deputies have recovered since 2009. Recovering human remains in the heat of a South Texas summer is not for the faint-hearted. The sight and smell of the dead can linger with you for days. It can give you nightmares if you let it. Whenever ranchers in rural Brooks County, 70 miles north of the Mexican border, find a body, which is often these days, they call the Brooks County Sheriff's Office. Chief Deputy Urbino “Benny” Martinez and his deputies are tasked with recovering the growing number of dead, and placing them in Department of Homeland Security-issued body bags — black bags for the recently dead, white for skeletal remains. The 57-year-old Martinez has been in law enforcement for 35 years. He isn't squeamish. 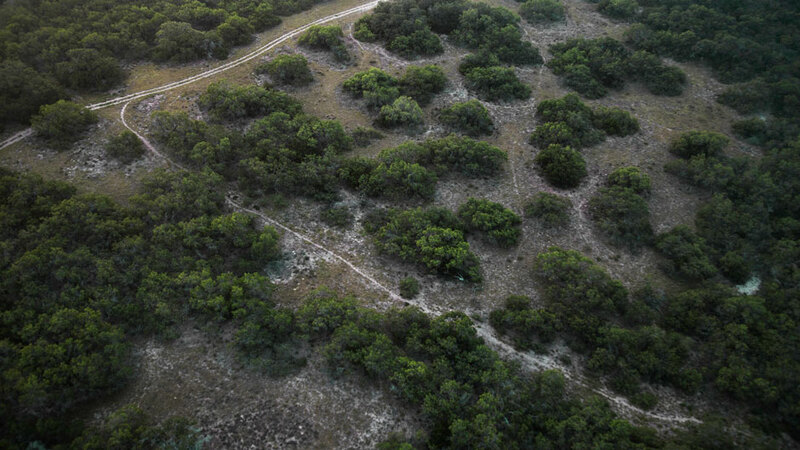 But the images of the dozens of bodies he's recovered in the ranchland haunt him. “You don't ever become accustomed to it,” he says. In 2012, Texas surpassed Arizona as the deadliest state in the country for undocumented migrants. Facing dwindling numbers and budget cuts, Brooks County sheriff's office presides over a busy immigration corridor. Since 2009, the sheriff's department recovered over 400 bodies in Brooks County. It can take hours just to reach the bodies through the deep sand, the cactus and the thorny mesquite. Often, cowboys or hunters find bodies in remote corners of the county because migrants and their smugglers take great pains to avoid detection as they walk around the nearby Border Patrol checkpoint. Martinez and his men often have to trek to the sites on foot because their county-issued vehicles can't handle the terrain. In 2009, Martinez took the job as chief deputy with the Brooks County Sheriff's Office. He'd recently retired after 29 years as a Texas state trooper, and he hoped to lead a quiet life in Falfurrias, the small town where he had grown up. “I just wanted to wind things down a bit,” he says. He never imagined, when he took the job, that he'd be sitting across a desk from so many grieving mothers looking for their children. 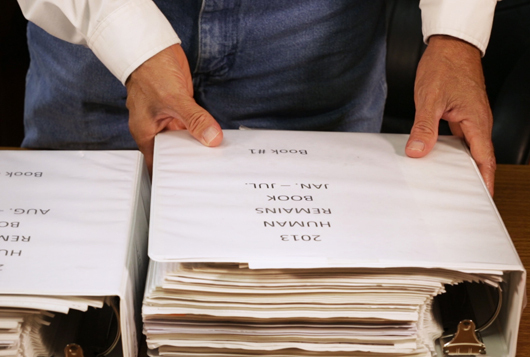 He never imagined the stack of thick binders documenting by year and by month the hundreds of bodies he and his deputies have recovered on the surrounding ranches. That year, Martinez and his men recovered 129 bodies from the surrounding ranches, a record for the rural county and the first year that Texas eclipsed Arizona as the deadliest state in the nation for undocumented migrants. It's early June, and Martinez, wearing a black cowboy hat and dark sunglasses, is steering his silver Volkswagen SUV through downtown Falfurrias toward Sacred Heart Cemetery, on the outskirts of town. Half of the buildings on downtown's main street are boarded up, but there's a busy Whataburger drive-through and two large truck stops that depend on customers from US Highway 281. It's the highway, which runs north from the border all the way to Canada, that draws migrants and smugglers to Brooks County. Martinez says Falfurrias has always been a corridor for immigrants. “Growing up, I remember we'd have people from Mexico walking along the little creek bed that went past my bedroom window.” Usually they were men walking alone or in pairs, looking for work. “Sometimes they would ask for a drink of water, then they'd move on.” Martinez and others in town didn't feel threatened by the people passing through, he says. Martinez pulls into the long drive that leads to Sacred Heart Cemetery. He's there to check in with Dr Lori Baker, a Baylor University anthropology professor, and her students. Baker and the students have volunteered to exhume the bodies of hundreds of unidentified migrants so that DNA and forensic tests can be performed on the remains in an effort to return them to their families. Martinez scans the cemetery for signs of Dr Baker and her students, but a cemetery caretaker tells him that, because of the triple-digit heat, they've already gone back to the hotel for the day. Not far from where the team is digging lies the Martinez family plot, where three generations are buried. Martinez and the sheriff were doing what they could, but there were too many demands for a small department to tackle on a daily basis, especially in a rural, 944-square-mile county: a growing number of sexual assaults of migrant women by smugglers, deaths on Highway 281 and gang-affiliated groups from Houston and other cities moving into the area to set up stash houses and prey on the thousands of migrants being moved through the county. Then, in January 2014, a bomb dropped. County officials announced they would have to cut their $4 million budget by half. The oil and gas wells Brooks County depended on for tax revenue were nearly tapped out. The first thing to go for the sheriff's department would be health insurance for Martinez's deputies and their families that had been one of the biggest benefits of a job with an average annual salary of $23,000. Martinez, who made $26,000 last year, took a pay cut; because he'd retired from the Texas Department of Public Safety, he still had health insurance through the state. His deputies were not so lucky. “Most of them are just starting their careers and their families,” he says. “So they had to move on.” Martinez had eight deputies last year. This year he has four. The department spends nearly half its annual budget on body recovery, autopsies and transportation of corpses. Martinez added up the department's expenditures on recoveries from 2009 to 2013 and came up with $628,000. “That's a pretty significant amount for a poor county like this,” he says. This year, the department received $152,000 in state funding for the first time to help offset the costs, but the department receives no federal money, unlike border counties, because it is 70 miles north of the international border. They would rather be saving lives than recovering bodies, he says. In the past year his department has received more than 600 emergency 911 calls from migrants hurt or dying on isolated ranches. With only a handful of deputies available to respond, Martinez relies on Border Patrol personnel stationed in the area to rescue many of the migrants, who suffer from dehydration and heat stroke. Last year, they rescued more than 350. Yet the average time for Border Patrol to respond to distress calls on the ranches is two hours or more, according to a recent investigation for Telemundo, The Weather Channel and The Investigative Fund at The Nation Institute, now known as Type Investigations and The Weather Channel by John Carlos Frey, a reporting fellow for the Investigative Fund. In August, after the broadcast aired, Border Patrol deployed a Search Trauma and Rescue (BORSTAR) team to Brooks County. “Now we're seeing response times of 10 minutes or less,” Martinez says. “When we have resources like this, it makes a difference.” But if history is any indicator, the BORSTAR team, which has been dispatched to Brooks County before, won't stay for long. There has recently been help from other sources, though. After the media reported that the sheriff's department had lost half its workforce, law enforcement personnel from the more populated border cities south of Brooks County contacted Martinez with offers to volunteer. Now he has 15 reserve deputies helping in their spare time.